Who's there? It's a Hairy Woodpecker. When he's not doing a number on the tree trunks, he's hiding sunflower seeds in the knot holes on the deck posts. According to the Cornell Ornithology site, the oldest known Hairy was almost 16 years old. Neat photo with the blowing snow. I've only seen Flickers here in S.W. Colorado. Wonderful capture anne. love the snow blowing in too. they are such pretty birds,but also a pain in the neck... One of them pecked a hole in the wood siding of my neighbors home. Sweet shot. Do I see a little blowing snow? 15 degrees (F) here right now!!! Great shot. Never heard of a bird behaving like a squirrel before. Wonderful Capture! Love the "Woodys" and all their character! Nicely Done, Anne! I enjoy your extra information about the birds very much. Cool capture. He looks a lot like the downys but I understand the hairy woodpecker are a lot bigger. What a great shot! He's a cute little guy! @vernabeth thanks beth! yes, they look a lot like the downys. Great capture! Didn't know about hiding nuts - good to know. Great capture . . love the bird's color. 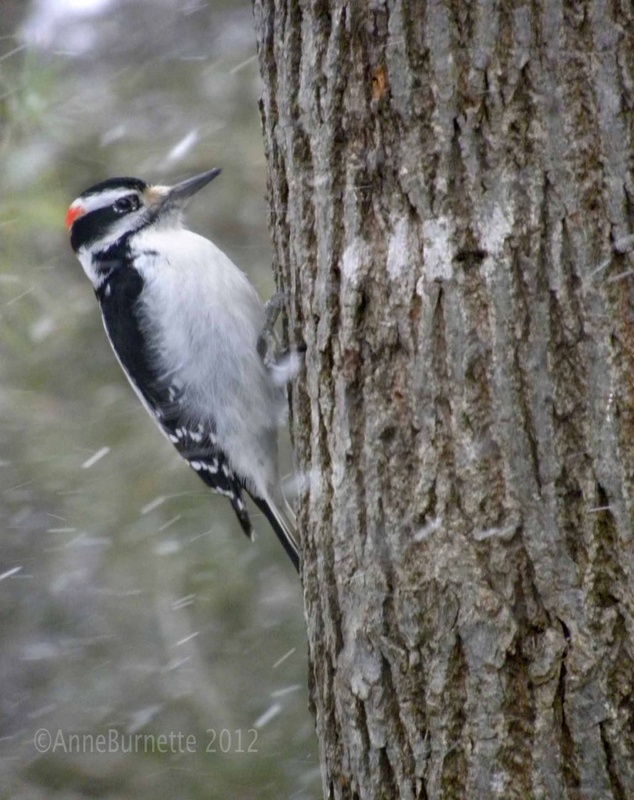 Woodpeckers don't always knock on trees. Sometimes they find a spot on the house and hammer away! Thanks for your info . . always interesting. Thats a great capture indeed. Love the textures and snow blowing - beautiful shot Anne. Excellent capture. Love how you caught the snow, too. I've had so many of these at my feeders lately! I love the blowing snow in this one. hard to see these guys but so easy to hear where they are. Beautiful shot. And he looks so harmless. Wow! Awesome closeup capture. He looks a bit like our 2 little downy woodpeckers, but I've not been able to get any good shots of them yet. I need to put out some suet cake!! That's an amazing shot. Good info. Great detail. I love these little guys. They're so fun to watch out in the yard. Great capture, good detail. Still trying to get a shot of one over here. Love these woodpeckers. They always grab my attention. Nicely captured in the snow. Looks like he's battling against the snow. Brilliant shot. Nice. We have those birds. It's hard to believe they live for 16 years. Who knew? Looks like it is snowing up your way. So far nothing here. Great shot of him, I love that red head.....! great shot! love the way the snow looks too! Great capture of a beautiful bird. From afar. Up close they make holes in our cedar siding of our house. We feed them lots of suet to keep them away from our house. He's wonderful, and also nice to catch some snow as well. this is a great shot, Anne........the blowing snow just adds to it.....definitely a fav! What a beautiful capture with that blowing snow! Lovely capture of the guy! i saw one of this last weekend but it flew away as soon as i did. dangit! where's that camera when i need it! nice capture, anne. Beautiful bird, and you've captured him so well. A fav. @sunnygreenwood haha...with a picnik.com shovel of course. great shot ~ you have some magnificent bird photos, Anne! Don't you wonder if they ever get headaches?!? Superb capture! !